I'd been waiting years for a new Solitaire model and the new plastic one didn't disappoint. For my Solitaire, I only made a few minor changes. I wanted to replace the outstretched left hand as I think the positioning of the fingers and the angle of the wrist looks unnatural. I also used a slightly larger base to give the model a bit more presence and I relocated the broken soulstone from the ankle to the chest. 1. The conversion was relatively straightforward. The weapons have been swapped around so that the Harlequin's Kiss is on the outstretched left arm and the Harlequin's Caress is on the raised right arm. 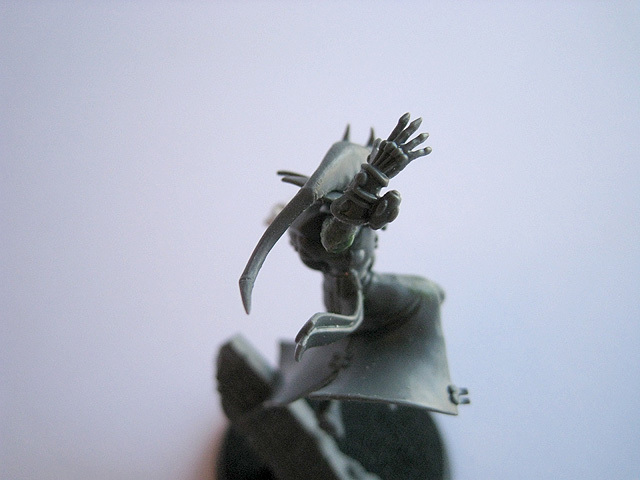 This improves the dynamic of the model in my opinion; the right hand is raised above the Solitaire's shoulder and the twist in the torso combined with the forward movement makes it appear as if the Solitaire is poised to rake the Caress across an enemy's face. 2. A close-up of the Harlequin's Caress. This was taken from the standard plastic Harlequin boxed set. 3. 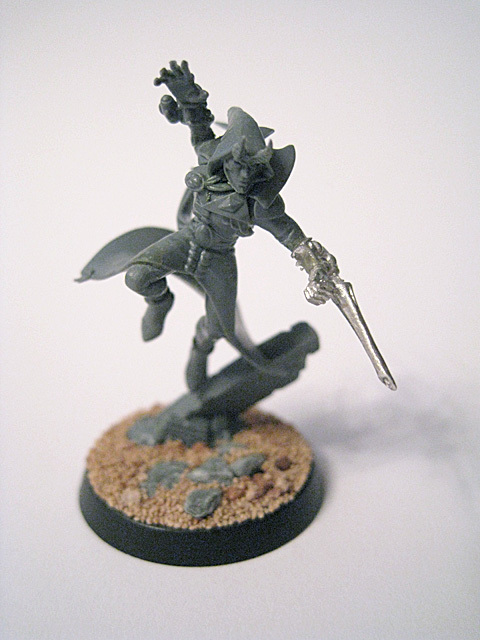 The metal left forearm (with the Harlequin's Kiss) was liberated from one of the older metal Harlequin models. 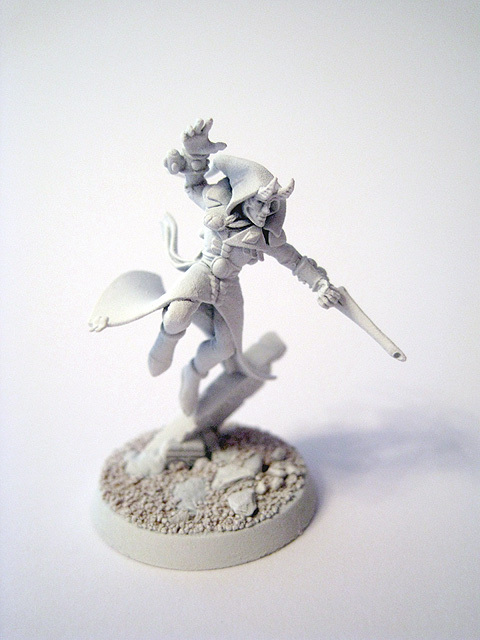 None of the new plastic Harlequin models have the Kiss on their left arm, so this also serves to make the Solitaire stand out a bit more. 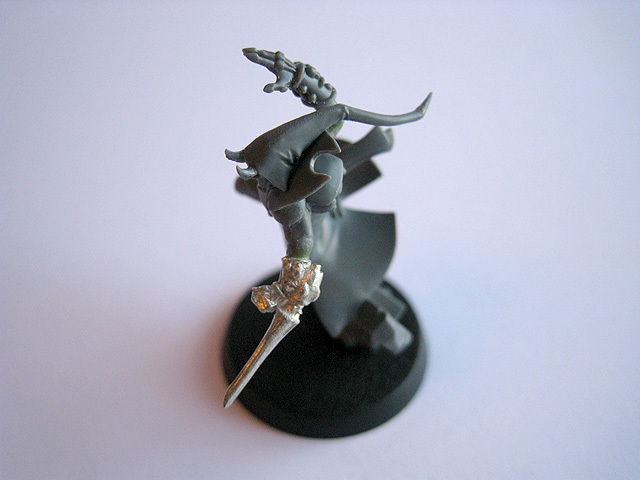 I moved the broken soulstone from the Solitaire's ankle (a bizarre choice) to a Green Stuff ribbon around his neck. It makes more sense to me there; a constant, clear reminder and display of what he has sacrificed in service of the Laughing God. I elected not to use the diamond-shaped holofield effect on this model as I don't particularly like it. 4. An alternative angle of the model. 5. 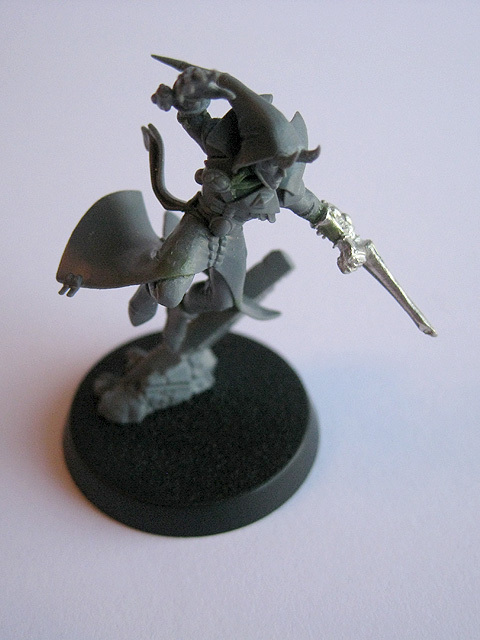 The assembled model, after basing. 6. 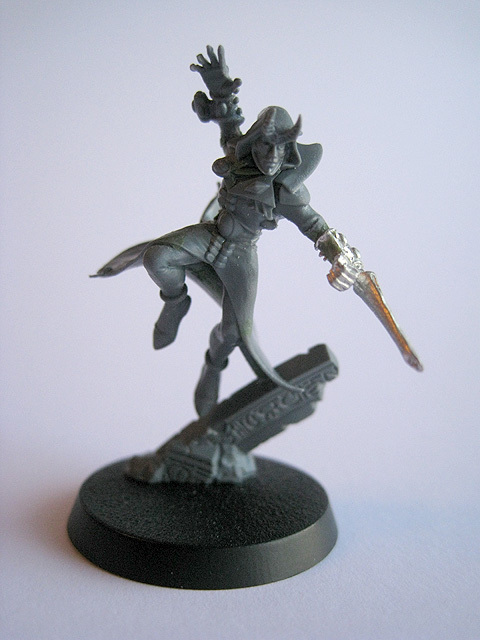 The model, after undercoating.